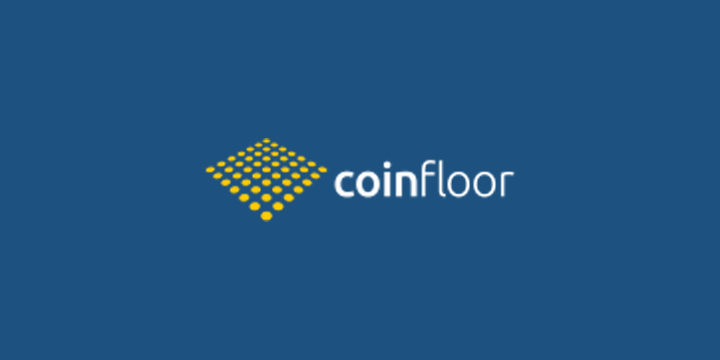 Established in early 2013, Coinfloor exchange is one of the UK’s original cryptocurrency exchanges. Famed as “London’s cryptocurrency exchange”, the exchange has attracted significant investment from external sources in recent years, allowing it to provide competitive Coinfloor trading fees and an intuitive platform suitable for beginner and experienced crypto investors alike. At Bestbitcoinexchange.io, our Coinfloor Exchange review explores in detail the platform, its fees and overall reputation within the crypto industry. Read our review to find out whether Coinfloor is a safe place to buy Bitcoin and Ethereum and other popular altcoins. The exchange is headquartered in London, UK. It is operated by an entrepreneur named Mark Lamb, who is listed on the Forbes’ ’30 Under 30′ index for successful entrepreneurs in finance. The platform’s tagline is: ‘the UK’s No. 1 Bitcoin exchange’, which suggests from the outset that it focuses largely on Bitcoin. However, it also offers five other cryptos to buy and sell, including Ethereum and Litecoin. The founders also pride themselves on being the most liquid cryptocurrency exchange in the UK. The site periodically publishes audits of its system to give peace of mind to its users that their funds are held responsibly. The Financial Times recently called Coinfloor ‘the biggest exchange for bitcoin-to-sterling’. However, it also accepts payments in other fiat currencies, which we’ll cover later. Coinfloor provides support for all the mainstream coins and, as an added bonus, also supports Bitcoin Cash and Ethereum Cash, the hard forks of Bitcoin and Ethereum, respectively. At Best Bitcoin Exchange, we believe it is important that cryptocurrency investors understand what they are signing up for when placing their trust in a cryptocurrency exchange. Our review tests and rates all aspects of their crypto exchange, including the range of crypto coins available to buy and sell, the trading fees incurred, the responsivity of its customer support and the ease of which users can sign up for a trading account. You might be wondering, is it safe? Don’t panic, our review will determine whether or not it is a trustworthy exchange for our readers. If you’re wondering what Coinfloor’s policy is on deposit and withdrawal fees, you’ll be pleased to hear it has recently adopted a no-fee policy when it comes to depositing and withdrawing Bitcoin and fiat currencies into the exchange. There are however fees of 0.38% for trades of $1,000 and above. Fiat currency withdrawals via GBP and USD will take up to five business days to clear. Meanwhile, EUR withdrawals will arrive in your bank account within two business days. There are no withdrawal fees at the time of writing. Fiat currency deposits via international wire transfers can take between 0-5 business days to arrive. The site’s Priority or Express transfer can move your funds into your trading account within a matter of three hours. Bitcoin and Bitcoin Cash deposits can be processed 24/7. The minimum Bitcoin and Bitcoin Cash deposit amount is 0.05 XBT, with no fees charged. Deposits made using this payment method are usually credited to your Coinfloor trading account within an hour for Bitcoin and up to ten hours for Bitcoin Cash. Users can fund their account via fiat currency wire transfers. Be sure to use your reference code and specify the currency you’re sending when ordering the transfer with your bank.At the time of writing, Coinfloor does not allow its users to buy Bitcoin with PayPal or other e-wallets. The exchange gives users access to two APIs via HTTP and WebSockets, both of which are optimised for exceptionally low latency connections. Users can locate access keys to both APIs via the client dashboard area. The Coinfloor Trader application is designed for operation on Windows, Mac and Linux-powered devices. This software is most commonly used by retail day traders that demand swift and reliable trade executions. The mobile app can also be used to monitor positions on smartphones and tablets. The Xchange Financial Trader API is designed to hook up to more than a dozen Bitcoin exchanges. Traders can use the Xchange functionality to access up-to-the-second market data. In the event that you have any issues with the trading platform, users can submit online support tickets in English and Polish. The help system is also full of frequently asked questions (FAQs) designed to provide you with a swift response without having to contact a member of staff. At the time of writing, Coinfloor does not offer live chat functionality or a telephone helpline. Arguably the most impressive feature about the exchange is its 100% cold storage of user funds. All Bitcoin (private keys) sent by users are received, stored and sent out from various underground vaults, ensuring the same security standards as the Bank of England. The Coinfloor Bitcoin exchange was also the first to hold all its users’ Bitcoins in Multi-Signature Pay 2 Script Hash (P2SH) cold storage. Hit the ‘Sign Up’ button in the top navigation bar and complete the three-step process. Your new Coinfloor account will require identity verification. To accelerate this process, provide the Coinfloor team with one of the following: valid passport, high-quality colour image of your documentation, driving license or non-UK national ID card. To deposit funds, log in to your Coinfloor account. Select the ‘Deposit’ button at the top navigation bar. Select the asset you wish to deposit and follow the on-screen instructions. To withdraw cryptocurrency, select the ‘Withdraw’ button within the ‘My Account’ section. You’ll need to provide your cryptocurrency wallet address in order to submit a withdrawal request. Hit the ‘Exchanges’ button on the navigation header once logged-in to make a deposit. Click on ‘Access Trading’, select your desired cryptocurrency and click either ‘Buy’ or ‘Sell’. Unfortunately, Coinfloor Exchange does not offer its own built-in wallet to store cryptos. Don’t worry though – we’ve listed and reviewed all of the leading crypto wallets to help you on your way. In summary, there is no doubt that Coinfloor is a serious cryptocurrency exchange. You only have to look at its commitment to security and its 100% cold storage of user funds to realise they care about their clients. However, the exceptionally high minimum deposit amounts of $1,000 will deter all but the most serious cryptocurrency investors. Furthermore, its unregulated nature will also put some people off investing such serious sums of money into digital assets via Coinfloor.